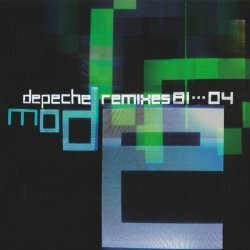 Remixes 81–04 is an album by British electronic music group Depeche Mode which was released on 25 October 2004. It was the band's first release since Daniel Miller's independent label Mute Records was acquired by industry major EMI in 2002. It features well-known remixes from the band's back catalog as well as previously unavailable mixes. There are three versions of Remixes 81–04. The main version has 2 CDs. The limited-edition version has the same two CDs, plus a bonus CD with mostly new remixes. There is also a one-CD release with selections from all three discs. The booklet, found in all three versions, features an essay by Paul Morley. A special "Secret Website" (now offline) could be unlocked with the CDs. During the promotion of the limited three-CD edition of Remixes 81–04, the above mentioned site was launched for fans who bought the bundle, which featured exclusive goodies. There was a special digital download-only bundle entitled Remixes 81···04 Rare Tracks, which is now offline for all songs except one listed below. It was accompanied with official artwork (also download-only). Users who bought the entire bundle could burn the tracks to a 90-minute CD-R (the whole album lasts 88:32) and print the artwork. In this case, you may say that the album has four CDs.